As Per The MANUU Revised Notification Schedule is As follows. 1. Polytechnic Diploma and D.EL.Ed. 2. UG Programs: B.Ed. and B.Tech. 3. PG Programs: MA(Arabic)/ MBA / MCA |M.Tech & M.Ed. 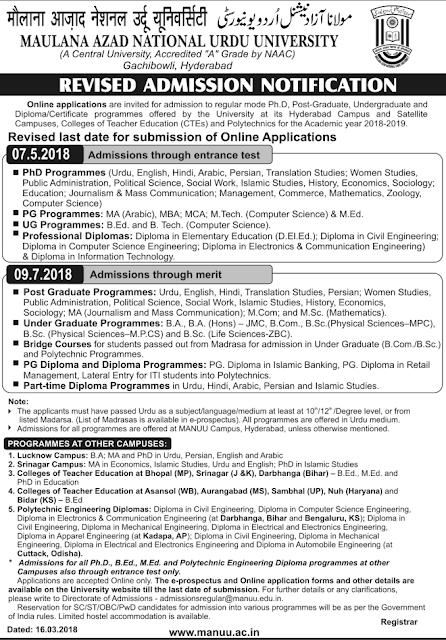 Online applications are invited For admission to regular mode Ph.D, Post-Graduate, Undergraduate and Diploma/Certificate programmes offered by the University at its Hyderabad Campus and Satellite Campuses.Colleges of Teacher Education (CTEs) and Polytechnics for the Academic year 2018-2019. PG Programmes: MA (Arabic), MBA: MCA: MTech. (Computer Science) & M.Ed. UG Programmes: BEd. and B. Tech. (Computer Scrence). 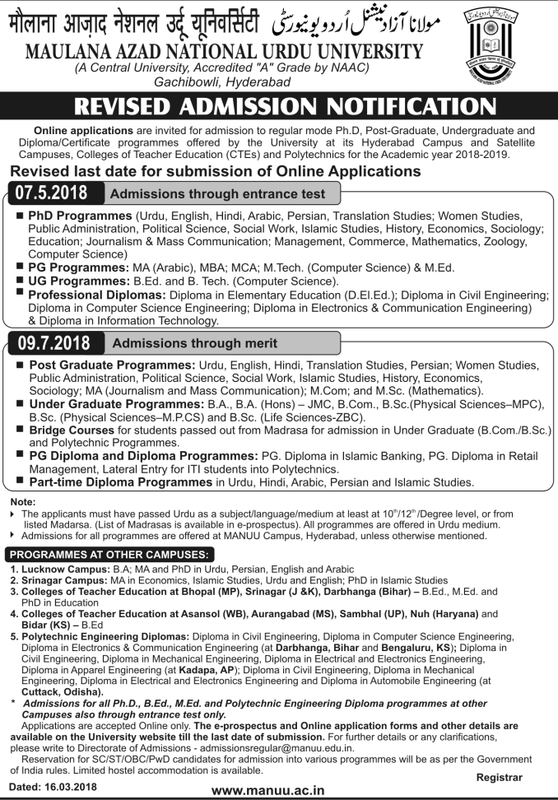 Professional Diplomas: Diploma in Elementary Education (D.El.Ed ); Diploma in Civil Engineering; Diploma in Computer Sciences Engineering; Diploma in Electronics & Communication Engineering) & Diploma in Information Technology. Post Graduate Programmes: Urdu. English, Hindi, Translation Studies. Persian; Women Studies. Public Administration. Political Science. Social Work, Islamic Studies. History. Economics, Sociology: MA (Journalism and Mass Communication). M Corn; and M.Sc. (Mathematics). Under Graduate Programmes: B A, BA(Hons)- JMC, B.Com. B.Sc (Physical Sciences-MPC), B Sc(Physical Sciences-MPCS) and B.Sc. (Life Sciences-ZBC). Bridge Courses for students passed out from Madrasa for admission in Under Graduate (B.Com/B.Sc ) and Polytechnic Programmes. 3 PG Diploma and Diploma Programmes: PG. Diploma in Islamic Banking, PG Diploma in Retail Management, Lateral Entry for ITI students into Polytechnics. Part-time Diploma Programmes in Urdu. Hindi. Arabic. Persian and Islamic Studies. 5. Polytechnic Engineering Diplomas: Diploma in Civil Engineering Diploma in Computer Sc ence Engineering.Diploma in Electronics & Communication Engineering (at Darbhanga. Bihar and Bengaluru. 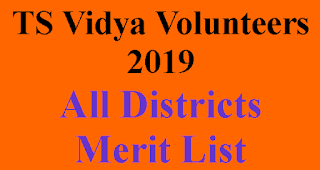 KS ; Diploma in CIVII Engineering, Diploma in Mechanical Engineering Diploma in Electrical and Electronics Engineering, Diploma in Apparel Engineering (at Kadapa. AP). Diploma in Own Engineering. Diploma in Mechanical Engineering Diploma in Electrical and Electronics Engineering and Diploma in Automobile Engineering (at Cuttack. Odisha). Admissions for all Ph.D, B.Ed, M. Ed and Polytechnic Engineering Diploma programmes at other Campuses also through entrance test only. Applications are accepted Online only. The e-prospectus and Online application forms and other details are available on the University website till the last date of submission. For further details or any Clarifications. please write to Directorate of admissions admissionsregular@manuu edu in. 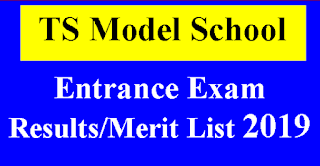 For all admissions, online registration for a candidate is mandatory. Provide your correct and functional Email and Mobile Number only as all future communication (including login id and password) will be sent only to this email and mobile number. Login id shall be your email address and password will be sent after registration to Email address. Using login and password you can fill your application form. A Single Registration is sufficient for applying to the multiple programs. In case you have lost/forgot your password, Please use Forgot Password link to retrieve password. New password will be sent to you on your registered email. Scanned copy of colored passport size Photo (3.5 x 4.5 cm) and Signature (3.5 x 1.5 cm) in JPG/JPEG format only. The file size of scanned photo should be less than 100KB and signature less than 50KB. Your Email address & Mobile number. Proof of Urdu studied either as a subject or as a language or as medium of instruction or one among the listed Madrasas at 10th / 12th /Graduation or Post Graduation level .